Attending worship for the first time at a new place can sometimes be confusing—we get it. Each week we welcome a variety of first-time visitors and guests. At WPLC, regular worshipers are quick to greet visitors and help them out with any questions, but it can still be helpful to know a little bit about the worship experience first. When you enter the worship space, we hope you’ll immediately feel at home in the traditional setting. Pew seating encourages people to sit near one another and build community. We sing, read the Scriptures, immerse ourselves in the sacraments of Communion and baptism, and gather together as God’s faithful community. 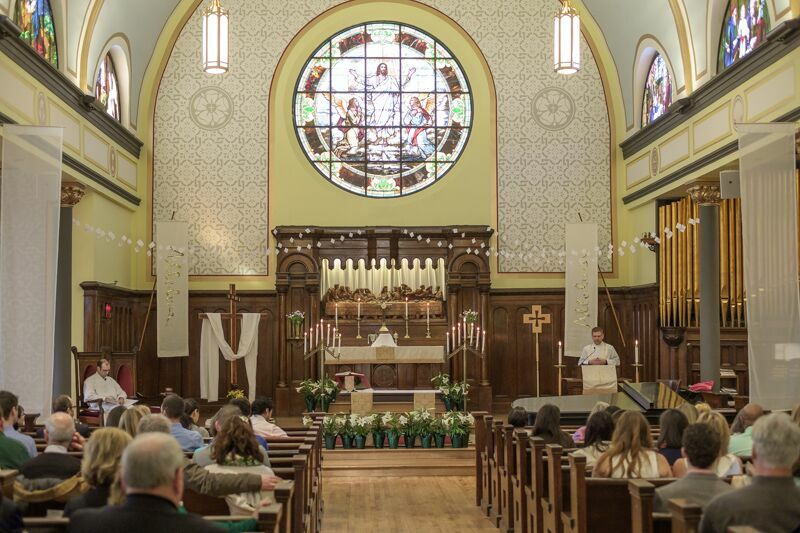 We are a liturgical church that allows the cycles of our lives and the church year to connect as a defining experience. Yet traditional doesn’t mean stuffy or out of touch. In fact, our worship is often described as theologically-expansive. We welcome people of all genders and gender identities, races, sexual orientations, marital statuses, ages, abilities, immigration statuses, and socio-economic backgrounds. We have gender neutral bathrooms, a staffed nursery during Sunday services, and Sunday school for children in kindergarten through fifth grade on Sunday mornings. Click here to read more about our expansive-welcome. Part of welcoming all people is making worship participatory. We value an inter-generational approach to gathering together, and we’re known for making Sunday family-friendly with the sounds of all ages filling our space. Click here to learn more about Sunday Funday for Children. Children have a designated faith-based play space in the sanctuary, all are invited (but not required) to sing and partake in Communion, and many help out during the service as a way of serving God and others. Our user-friendly and ecologically-mindful worship bulletin will guide you through the entire experience. The worship experience at WPLC is often multisensory. We smell the incense on holy days, we hear the sounds of musical instruments, we see the divine around us through profound bows to one another, we taste the body and blood of Christ, and we feel the hands of our community members as we pass the peace. If you’re up for it, often there are hugs at the door on your way out! This multisensory experience communicates the transcendent quality of worship. Our worship is one that is held in the tradition of our ancestors. We read the same Scriptures, we follow the same liturgical order, and we connect with all those of different times and places gathered around the Word and Sacrament. Yet our worship is still relevant today. Through song, preaching, and special service elements and rites, we deepen our understanding of how the Scriptures speak to us here and now, and how the texts inform our lives and shape our future. We come together to discern God’s call and live out lives for peace and justice. To get a feel for our preaching, you might want to click here to read or listen to some sermons.